Marianne grew up on the family farm near Meath Park, Saskatchewan, and graduated from Meath Park High School in 1971. She attended the College of Commerce at the University of Saskatchewan, obtained a diploma in Local Government Administration with the University of Regina in 1976, and then returned to Saskatoon, obtaining her law degree from the University of Saskatchewan in 1981. Marianne received her Queen’s Counsel (Q.C.) appointment in 2017. 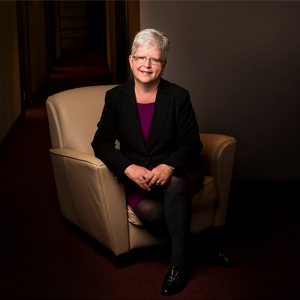 After graduating from law school, Marianne worked as the Town Administrator for Rosthern for five years, commenced her own law practice there in 1988, and joined the firm in 1993, operating the Rosthern office full-time. Her preferred areas of practice are real estate and mortgages, wills and powers of attorney, estates and probate. She is a member of the Canadian Bar Association, has been a presenter at Continuing Legal Education seminars, and an on-line facilitator for the Bar Admission Course. Over the years, Marianne has served as secretary of the local school board, alderman of the Town of Rosthern, chair of the local hospital board, and vice‑chair of the Gabriel Springs District Health Board. She has been a member of the Rosthern Lions Club for almost 20 years, and was the 2016 Alberta- Saskatchewan-Northwest Territories Volunteer Award Recipient at the national Canadian Blood Services Awards in Ottawa.